We went to a gig yesterday afternoon, it was great. The band were full of energy, there was lots of lunatic dancing, enthusiastic audience participation and some brilliant Christmas song interpretations. A gig in the afternoon you say? Well, yes, it was a gig for children under seven and their family. It’s not an unusual concept, London saw the start of the mini disco which has spread in popularity, but there’s not a lot out there in terms of live music. The Rockin Rhinos were formed from a rag tag group of especially talented, seasoned musicians with a single mission in mind; to improve the dire music offered to smalls….and throw in a bit of education. We’ve been to see them once before with good friends and we all thought they were fab. Edith took their newly released album, which includes phonic spellings of animals in Old MacDonald, into nursery and I hear it was roundly enjoyed. When they announced that they were doing a Christmas show two short months later I was worried it would be too soon. I held off telling Edith we were going until the day before and I’m glad I did because she was positively bursting with excitement. Actually, that might have contributed to her slightly lessened freaky dancing at this gig as the short build up was quite overwhelming. No matter, we got to the MMU Union just before it started and old friends, grown up and small greeted each other with joy. Then the band came on. 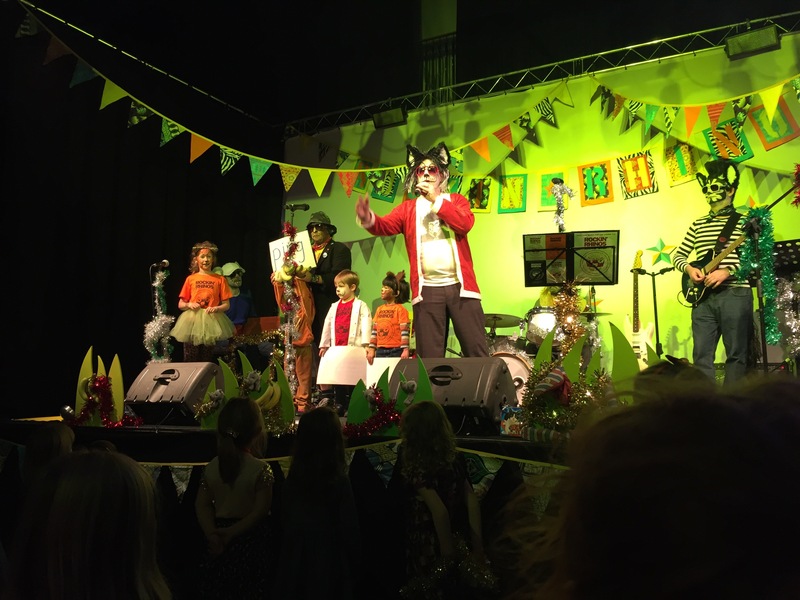 Dressed as animals that include John Cooper Cat, Guy the Gorilla, Debra the Zebra and Mani the Mouse (parental demographic firmly established there) they launched into their theme music followed by firm adapted nursery rhyme favourites and altered Christmas numbers. It’s wonderful watching children when they experience live music. They start off with a bit of shocked awe, especially if, as many children are, they are a bit sound sensitive. The volume is just right for small ears but of course, live music has an energy and immediacy of its own. Once they’re past that the dancing starts…lots of pogoing and unique moves. The great thing about the Rockin Rhinos is their ability to adapt songs, that through endless repetition at parent/child groups, your first reaction is an eye roll, into highly contagious and witty numbers. The aforementioned Old MacDonald is one but the lilting and gentle pacing with the phonics spelling of animals (c-o-w) works well. More so at this gig as it was Father Christmas who had a farm with a Ho Ho Ho here……when John Cooper Cat wasn’t caught out by these edits. Other favourites were the Mustang Sally inspired version of Little Donkey, a version of Monkey Man originally recorded by Toots and the Maytals that Edith knows well, a punked up version of the Wheels on the Bus and the Ramones derived Blitzkreig Bop which becomes the counting song. Edith in particular loves this one and walks to nursery are supplemented by stomping along shouting “hey ho, let’s go!” Lest you were worried Noddy Holder got left off the set list there was of course Slade’s Merry Christmas specially pitched at the dads for the final protracted bellow of “it’s christmaaaaaaas” at the end. I have to say though, my ultra favourite is the Growing Up Song which also appears as two versions on the album. The lyrics, musical references and the tune are sublime and I sing it for days after. It’ll be a little longer to wait for the next gig but what better review from a small could you want?